patriotism | Red Said What? On Veteran’s Day, a nation pauses to appreciate the service and sacrifice of the men and women who traveled to foreign lands, leaving behind mothers, fathers, siblings, spouses and children to defend a set of common values and fight for a greater cause. Messages thanking veterans for our American freedom are commonplace during the holiday. But the profound ways in which they have touched the lives of strangers when they’re far from home not only in the moment, but for generations thereafter seem overlooked. For me, their impact only began to resonate when I visited the D-Day memorials in the Normandy region of France. 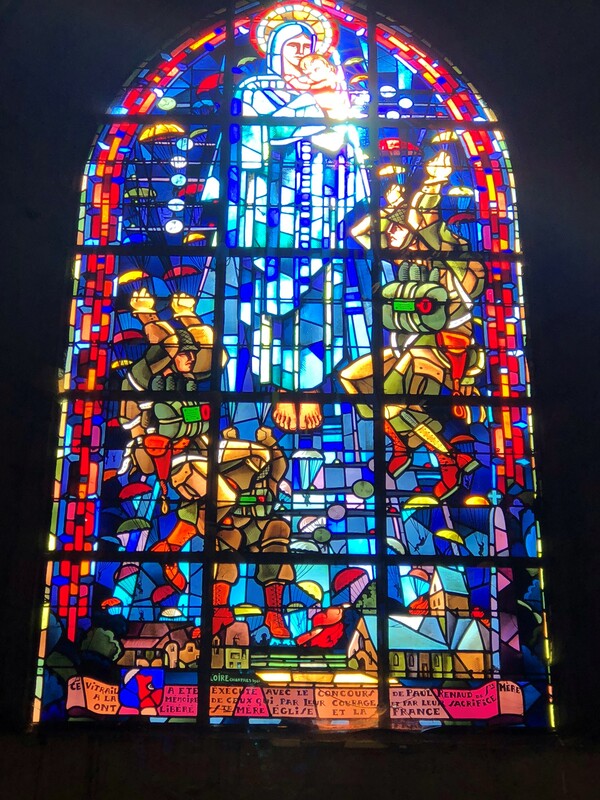 I went to Normandy to experience the setting of my grandfather’s first World War II battle where, as an 18 year old, he found himself locked in a room in the underbelly of a cruiser, feeding bags of gun powder through a shoot as his ship supported the American troops storming Utah Beach and paratroopers swarming the surrounding countryside while Nazis showered bullets upon them all. As I stood on the historic sites, walked through the cemetery and read my way through museums, I felt as expected: humbled and moved. But it was at the dining table of my bed and breakfast during a conversation with a Dutch family from the suburbs of Rotterdam, a couple with two daughters close to my boys’ age when the magnitude of the role our veterans play struck. The husband told me his deep interest in World War II stemmed from a personal connection. At 17, his father was captured by the Nazis and put in a work camp. He was not a well boy, and his health only deteriorated under captivity. American soldiers rescued him. The man told me that if they had come a few days later, his father would not have survived. He went on to say how it never ceased to amaze him that Americans left their lives and traveled across an ocean to save people they didn’t know and from whom they could personally gain nothing. Just like I had come to pay tribute to a veteran, this husband had used his vacation to drive with his wife and children from the Netherlands to Normandy so together they could also pay tribute to the Americans who saved his father, his country and in his mind, the world. His is one story, one account of how a small group of soldiers gave a young man life. No doubt, there are countless more about veterans past and present who, as they fought tyranny, oppression, bigotry and fear also touched other humans in positive and lasting ways all over the world. I wish there was a book to house such tales, so we could thumb through its pages when we as individuals or a nation find ourselves moving inward. Our veterans are the purest of patriots. They are a group who set aside their individual interests to keep our nation’s moral values alive while remembering to take care of their fellow man along the way regardless of his or her place of origin. To tout greatness as something only best achieved through self-interest and isolation and to privately disagree but remain silent in public is more than an insult to past leaders, allies and the moral pillars upon which our country was built, it’s a betrayal of every man and woman who ever put their lives at risk to spread hope and uphold liberty. Veterans Day 2014 started out no differently than any other; with good intention and marginal action. 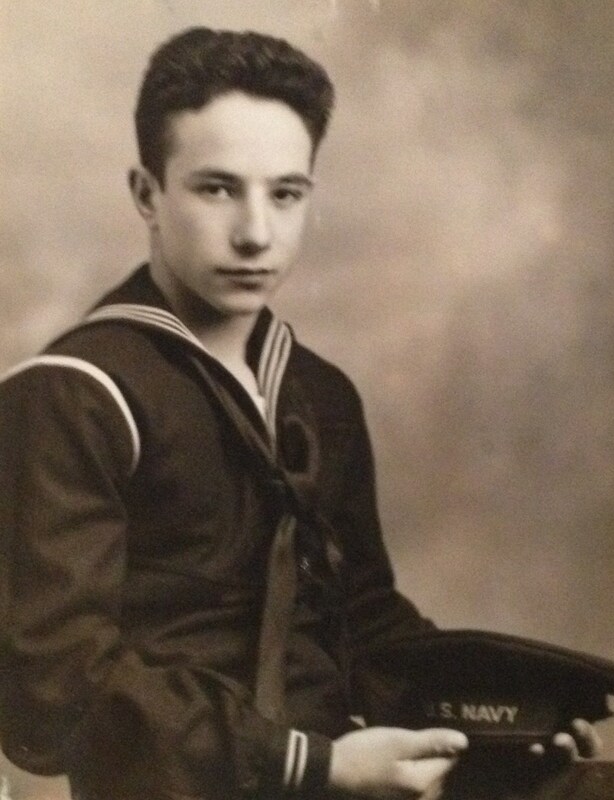 Each November 11th, I’d think about my grandfather Joe, a World War II Navy Veteran. The thought was typically followed by an appreciative email or indebted Facebook post. Some years I’d even make the old fashioned phone call. Soon distracted by child rearing logistics and household priorities, I’d call it a day and opt out of making the 45 minute drive to pay a visit. This time however, I had left Skootch’s red accordion at Joe’s house a few days before and much to the child’s dismay, had only the purple one at home. So in an effort to temper a peppering five year old, the boys and I piled into the Outback and joined my grandfather for lunch. Joe greeted his great-grandsons at the door, offered respective kisses, and held them on the landing. “Did you see my American flag?” he asked. It was no surprise and nice to see that despite having recently lost his wife of 65 years, Joe remembered to dress the pole he had raised between a patch of hedges adjacent to the front stoop to commemorate the holiday and a defining time in his life. Bubbe smiled shyly and gave it a go. The Skootch puffed his chest, cupped his palm and looked at it. Joe helped the effort along. The group crossed the threshold and stopped in the front hall. “Do you fly one at home?” he asked. Joe didn’t wait for an answer. “Here take these.” He snatched a pair of parade flags from a collection stored in a nearby bucket. The Skootch marched up to the second floor apartment, waving his new toy. 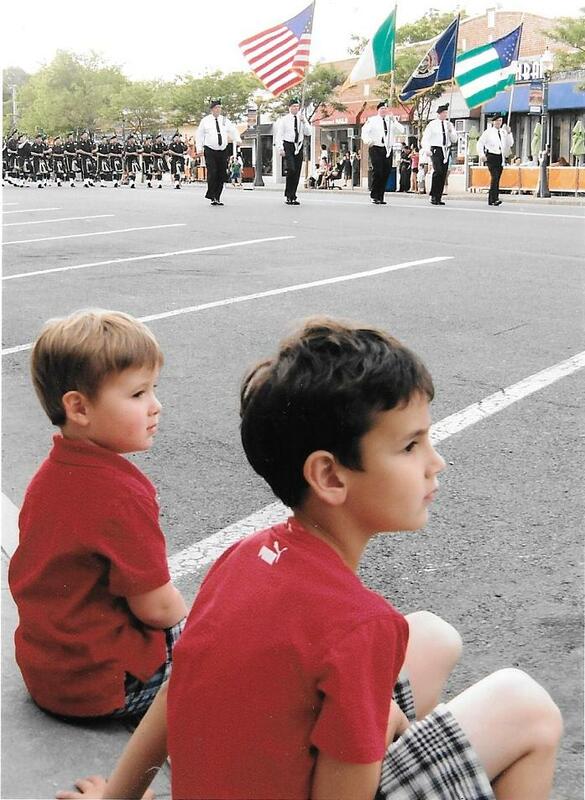 The parade was short lived. Toddler sized penguins and a Santa Claus were performing center stage in the living room. He dropped the flag. My grandfather rescued it. “No. Never let it touch the ground. Out of respect and honor, the American flag should always point toward the sky,” he explained. “Let’s put it in a safe place.” He tucked the base into a puffy coat curled up on a Captain’s chair. Bubbe followed suit; partially to secure the flag but mostly to search for his great-grandpa’s Kindle Fire and Oreos in a nearby hutch. On route to the cookies, he noticed a glass display case perched near the front of the hutch shelf. It was filled with mounted, decorated ribbons laid out like a Holland tulip field. “What are these?” Bubbe wiped away the dust. “Those are my war medals,” Joe said and went on to explain them one by one. Will he ever really get it? When my children are grown, what will service, sacrifice, and country mean to them? It is wonderful that we have a proud, willing veteran in our family to share experiences but unfortunately, I can count on one hand the number of service men and women we know. Outside of my grandfather, Bubbe and The Skootch have had only the opportunity to interact with veterans or those in active duty during elementary and religious school programs. And as Op-Ed columnist, Maureen Dowd recently noted, with “one percent of the population voluntarily enlisting in the service,” it is likely that in the future, my boys will be exposed more regularly to comic book heroes than to everyday ones. Thankfully sacrifice, service, character, and citizenship are still being communicated in schools, through extra-curricular activities, at houses of worship and in our homes. Still, teaching young people the value of contributing to the greater good feels piecemealed, fit in, and a vehicle for resume padding. The potential for further disconnect in these formal settings seems imminent now that such lessons are being muscled from the spotlight by college, career readiness, English Language Arts requirements and STEM. In my state, there is even a motion to de-emphasize Social Studies. Israeli citizens get it. Out of necessity, conscription exists for most of the country’s Jewish Israeli population. Upon turning 18, men and women are obligated to serve in the military for three and two years, respectively. As a result, my 65 year old friend can relate directly to the experiences of an active soldier as well as identify with the five year old who knows he will one day fill those shoes. There, generations of citizens connect through collective responsibility and common experience. In February 2013, New York State Congressman Charles Rangel introduced a most recent version of the Universal National Service Act to the House of Representative’s Armed Services Committee. The bill requires all persons between the ages of 18 and 25 living in the United States, citizen or otherwise to perform two years of national uniformed or civilian service. Those choosing uniformed service may also be inducted during wartime, a national emergency, or a contingency operation. This CrossFit junkie would add that prior to selecting a service type; able-bodied participants attend basic training in cohorts. There is something to be said for intense, group exercise. It fosters camaraderie, physical and emotional growth, and team pride. To date, the bill has not moved in Congress. Yes. I realize the devil is in the details and that bigger government doesn’t necessarily translate into better outcomes. Yes. We do have a responsibility to teach our children in our families and community about service, sacrifice, and selfless giving. And yes, I too wonder about the mandatory component of such a program in a free society. Regardless, I think it is time to take meaningful action. Perhaps a national service requirement will shift expectations for and alleviate pressure on high school students, change the way the college admissions process is managed, reduce some of the direct financial burden on families trying to pay for higher education, and offer guidance for college graduates looking to take the next step. More importantly, perhaps it will build awareness and understanding for soldiers and veterans suffering trauma, make care and reentry a priority for when they return home, and simply bring us closer as a nation. in the service of our country can never be repaid. They have earned our undying gratitude. There is a way to repay veterans like Joe. Let us step away from the sideline to work in tandem with those on the front line in an effort to strengthen and preserve the solidarity of an already great nation. Let us pay the toll.